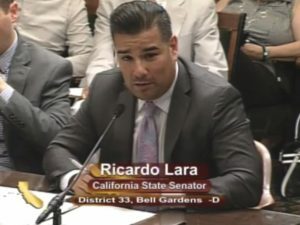 Senator Ricardo Lara testifies on behalf of SB 1383 near the end of the legislative session. As the California legislature took up the future of the state’s climate change laws this year, special attention was paid to enacting policy aimed at reducing methane emissions in the dairy sector. Dairies are one of the largest emitters of methane, a potent greenhouse gas. Legislators approved $50 million in FY 2016-17 to tackle the dairy methane issue, and passed SB 1383 and SB 859 to guide these efforts – including explicit authority for the state to regulate dairy methane emissions starting in 2024. These discussions also take on added significance as California ups the ante on its climate commitments, pledging to reduce GHGs to 40% below 1990 levels by the year 2030. Below we discuss the outcomes of this legislative session, and what they could mean for the road ahead. CalCAN first weighed in on dairy methane issues about a year ago, with our October 2015 report, Diversified Strategies for Reducing Methane Emissions from Dairy Operations. Our coalition recognized the need to present the sustainable and organic agriculture perspective as the Air Resources Board prepared its strategy to reduce methane emissions and other short-lived climate pollutants pursuant to Senator Lara’s SB 605 (2014). In our report, we discussed barriers to the success of anaerobic digesters on dairies – which had been the state’s sole strategy for reducing dairy methane – and instead presented our vision for an incentives-based approach that supports a diversity of strategies, including composting, pasturing, and other ‘shovel-ready’ solutions. In the letter, the producers went on to call for the state to spend a portion of funds for dairy methane strategies on non-digester strategies. We shared that letter with legislative leaders and the administration, and it led to a number of productive conversations. $50 Million to Spend: But How? As part of its long-awaited cap-and-trade spending package, lawmakers committed a total of $50 million dollars over the next year to be spent on dairy methane reduction activities. Recently, the Department of Food and Agriculture (CDFA) has spent these funds on a digesters-only strategy, investing over $11 million to support 6 digester projects. But as the work has evolved on how best to achieve methane reductions in the dairy industry, so has the administration’s approach on these issues. Although the legislature did not opt to dedicate a specific funding amount for these ‘non-digester’ strategies (as many in the dairy industry and CalCAN had suggested), we are hopeful that this language will help move state incentives in a direction that more appropriately meets the needs of dairies around the state. The most significant methane-related development this year was the passage of SB 1383 (Lara), the so-called ‘Super Pollutant Reduction Act’. This bill began its life as a way to direct ARB to implement its Short-Lived Climate Pollutant Strategy. From the start, CalCAN did not take a position on SB 1383, largely because we did not support ARB’s intention to begin the process of regulating dairy methane emissions starting in 2018. We did, however, engage with the author’s office and key supporters, explaining to them the merits of a multi-faceted, incentives-based approach to this challenge. By the time of its passage in the waning hours of the legislative session, SB 1383 was significantly amended. Unfortunately, many of those amendments reflect the perspectives and priorities of just one segment in an incredibly diverse California dairy industry. Much of the bill’s final language suggests a preference for digester and biogas technologies, rather than the ‘technology-neutral’ approach that many proponents had supported. This language – which was added to the bill with minimal public discussion and virtually no transparency – could have the effect of pushing state planning and investment even more in the direction of expensive, unproven technologies that will not work for the majority of California dairies. For example, the bill will require gas corporations to implement at least five ‘pilot’ projects for injecting dairy biomethane into the pipeline system. Only very large dairies are likely to be able to participate in these pilot projects, which will harness the methane generated by massive quantities of decomposing manure to produce a marketable fuel. To date, these types of projects have not gotten off the ground due to practical, technical, and financial challenges. Because of this last-minute provision, SB 1383 now gives dairy biomethane projects an artificial leg up, at the expense of the ratepayer, and potentially hampers the adoption of other dairy methane reduction practices in the process. Other provisions in the bill require state agencies to consider additional policies and incentives that would “significantly” increase biomethane and biogas production – again, without any analogous advantages given to non-digester strategies. The full text of the SB 1383 in its final form can be found by clicking here. Under SB 1383, the state will now need to focus exclusively on incentives-based approaches to dairy methane reductions until ARB’s authority to regulate begins in 2024. As this year’s bills are implemented, and as accompanying policies and programs are developed, we need to ensure that California’s efforts on dairy methane emissions are realistic given the diversity of our dairy industry. This should include, perhaps first and foremost, a recognition of how scale of operation plays a role, and the practices that work in different dairy contexts throughout the state. In the coming years, CalCAN will constructively engage with our partners in the dairy industry, with state agencies, and with the legislature to ensure that both incentives and regulations are structured in ways that achieve the maximum benefit for agriculture and the environment while engaging the full range of relevant stakeholders.